Owen & Fred, the men's essentials company, has a single mission of designing high quality everyday products that are manufactured in the USA, and turning them into something more. 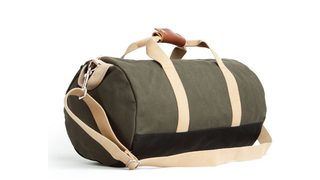 Their "Work Hard, Play Hard" duffel bag is a customer favorite that Deadspin readers can get for $90, a savings of 10%, plus free shipping. Use promo code DEADSPIN10. The zipper and hardware are nickel, the hand grip is leather, and it features a detachable shoulder strap extending from 24" to 46"
Roller suitcases be damned, this versatile bag is the go-to carry-on and perfect for the long weekend or a big day at the gym. Take 10% off now and get the bag for just $89 plus free shipping. Use promo code DEADSPIN10. The Promotions team (we're on the business side, not editorial) negotiates special offers on notable products. Interested in partnering with us? Drop us a line at promotions@gawker.com.